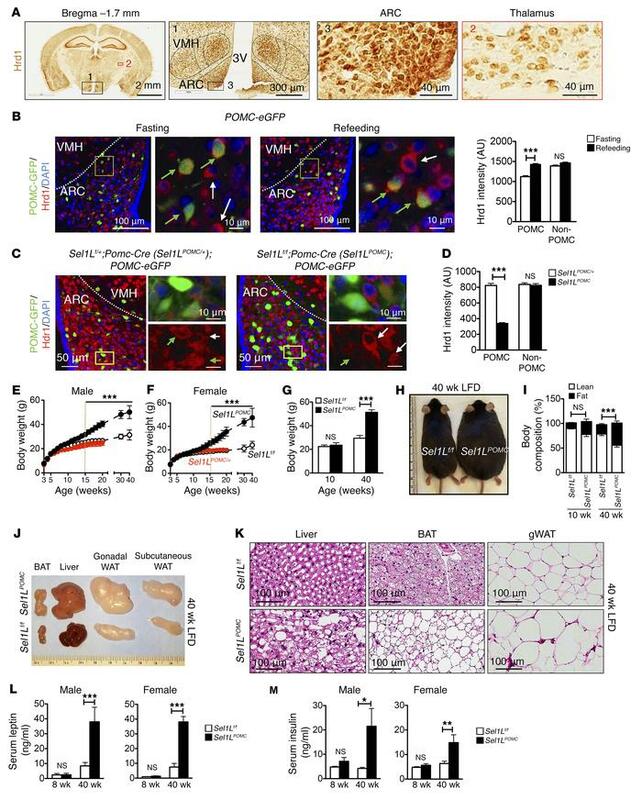 POMC neuron–specific Sel1LPOMC mice develop age-associated obesity and hyperleptinemia. (A) Representative images of immunohistochemical staining of Hrd1 in the brains of 7-week-old C57BL/6J mice on LFD (n = 2 each group). Zoomed-in images of ARC and thalamus are shown on the right. 3V, third ventricle. Representative images of negative control IgG are shown in Supplemental Figure 1A. (B) Representative images of Hrd1 staining in the ARC of 7-week-old POMC-eGFP reporter mice after an overnight fast with or without 6-hour refeeding. Quantitation of Hrd1 signals in POMC neurons (green arrows) and non-POMC neurons (white arrows) shown on the right (n = 2 mice each group, 70 neurons each mouse). (C) Representative images of Hrd1 staining in the ARC of 8-week-old Sel1LPOMC;POMC-eGFP and control Sel1LPOMC/+;POMC-eGFP mice on LFD (n = 3–4 each group). Green arrows point to POMC neurons; white arrows point to non-POMC neurons. (D) Quantitation of Hrd1 level shown in C in POMC and non-POMC neurons in the ARC (n = 70 and n = 100 neurons per mouse, n = 3–4 mice each). (E and F) Growth curve of Sel1Lfl/fl (n = 5), heterozygous Sel1LPOMC/+ (Sel1Lfl/+;Pomc-Cre, n = 3), and Sel1LPOMC mice (n = 7) on LFD. In E, a green dotted line marks the age at which Sel1LPOMC mice became significantly more obese. (G) Body weight of 10- and 40-week-old mice on LFD. (H) Representative image of 40-week-old mice on LFD. (I) Body composition of 10-week-old (n = 3 each) and 40-week-old (n = 6–7 each) male mice on LFD. (J and K) Representative images of peripheral tissues (J) and H&E images of peripheral tissues (K) from 40-week-old mice (n = 3 each group). gWAT, gonadal WAT. (L and M) Serum leptin (L) and insulin (M) levels of 8- and 40-week-old mice of both sexes fed ad libitum LFD (n = approximately 4–6 each group). Values are shown as mean ± SEM. *P < 0.05; **P < 0.01; ***P < 0.001, 2-way ANOVA.